With its new NOL10P 2nd-level order picker, Cat® Lift Trucks has expanded the scope for improving efficiency and productivity in picking operations. 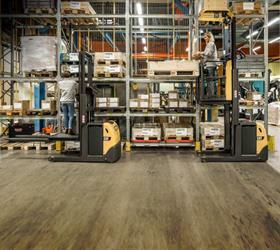 With its new NOL10P 2nd-level order picker, Cat® Lift Trucks has expanded the scope for improving efficiency and productivity in picking operations. A choice of configurations, including different rising platform heights, enables effective matching of the truck to specific needs. Ideal for many warehouse and terminal applications, this 24V, 1.0 tonne capacity model comes with a 1.2 or 1.8 metre rising platform. These give quick and easy access to pick at heights up to 2.8 or 3.4 metres, respectively. An LiftComfort, which raises picking containers to a convenient level for rapid transfer of picked items, is standard with the 1.8 metre platform and optional with the other. Performance settings can be selected to suit a variety of drivers, jobs and preferences, based on four main modes. Many of the truck's features have been specified to prevent slowing or interruption of its work. An accurate battery discharge indicator, for instance, helps in optimum timing of recharges. The order picker provides drivers with an advanced, user-friendly interface featuring a two-piece control panel. By integrating this into the chassis, the developers have been able to make the truck shorter and more compact while optimising the cabin shape and space. Its right-hand control unit is ergonomically designed to give excellent anatomical fit, positional adjustment, grip and support, for comfortable and precise operation. The left hand rests upon and operates the Midi steering wheel. A positionally adjustable sit-on or lean-on cushion is an option on trucks with LiftComfort. Step height is the lowest in the market, at 160 mm. Calculations show this saves an average 6,204 m of climbing effort, over a year, compared to competitors. A whole-floor driver presence sensor, with a cushioned, high-grip mat, adds comfort and permits safe operation from any standing position. Walk-through access is quick and obstacle-free. In contrast, traditional 'deadman pedals' can be tripping hazards and are easy for drivers to disable. Automatic speed reduction is another of the truck's electronic safeguards. It adjusts travel rate according to the steered wheel angle, to improve stability and safety during turns and high lifts. A SecurGate side gate system is standard on the 1.8 metre platform and otherwise optional. It reduces fall risk at all heights and prevents truck operation if gates remain open above 1.2 metres. An option on the 1.8 metre version only is the step-out warning system. This sounds an audible alarm and shows an on-screen message if a gate is open when the platform is above its lowest position. Ideal for many warehouse and terminal applications, this 24V, 1.0 tonne capacity model comes with a 1.2 or 1.8 metre rising platform. Primary safety features include the PoweRamic mast, which improves the driver's view for safe, accurate operation. Multiple storage compartments have been built into the cabin. As well as keeping the operator's equipment efficiently close at hand, they prevent clutter which could potentially cause accidents. An optional overhead guard can be added for safety and simple attachment of accessories. The order picker's drivers and owners benefit from an ATC t4 onboard computer and display. It enables PIN code log-ins, clear status information and fault warnings, quick diagnostics and easy driver settings. Selecting ECO mode slows down operations slightly but typically saves 5 to 6% on energy. There are further enhancements in the truck's AC drive motor technology, which offers greater torque, efficiency and control with minimal maintenance. Overall, the developers' intention has been to increase profitability by boosting performance while reducing servicing costs, accidents and energy consumption. For further information on Cat® lift trucks and warehouse equipment, please visit www.catlifttruck.com. See them in action via www.catlifttruck.com/videos and follow the news on Facebook and Twitter.